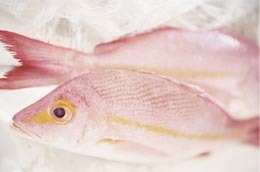 While pre-packed fillets have made buying fish far more convenient, they also offer a limited choice. You've experienced the fresh seafood of Moshi Moshi, now why not take up the challenge yourself and see what a whole fish has to offer? It should smell sea fresh - not fishy! It's worth bearing in mind that some apparently fresh fish may have been kept in cold storage for many months prior to being defrosted for sale - if in doubt ask! Certainly avoid any frozen fish that looks partially thawed.